100th Anniversary Documentary Available and More! Stop in to see the new addition to the Cherry Library. 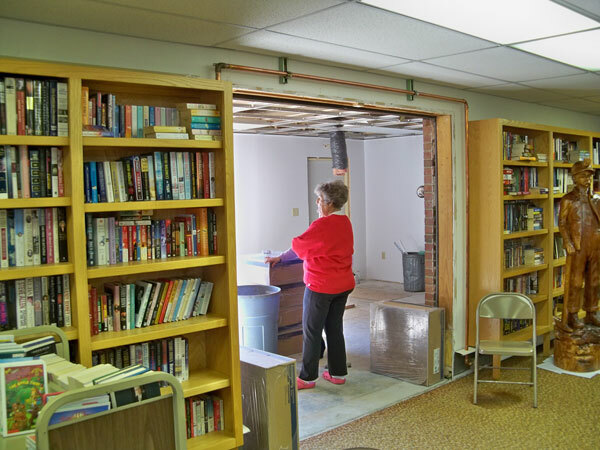 The image below shows ,Paula Brown, looking over the new room. Paula, unfortunately passed away in 2017. She is dearly missed . Most of the new exhibits have been added, and the new room is ready for you to see. The Library is usually open a few hours on Wednesday evenings and Saturday mornings. Call ahead to make sure. See contact/librarian info. Paula sadly passed away in 2017. We miss her. 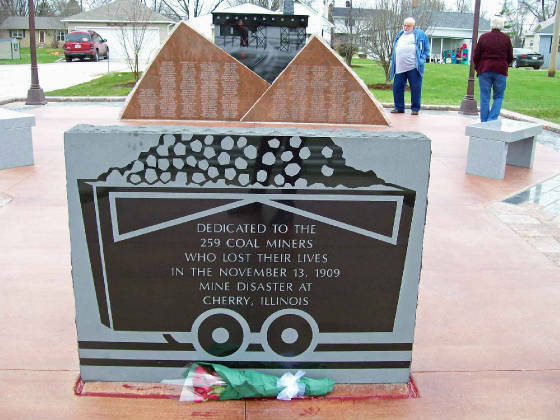 The Coal mine was located in Bureau County Illinois, in a newly erected town built near the mine, called Cherry IL., named after James Cherry who was superintendent of the St. Paul Coal mines. The mine opened in 1904 and was owned by the Chicago, Milwaukee and St. Paul Railroad (C.M.& St. P) railroad. 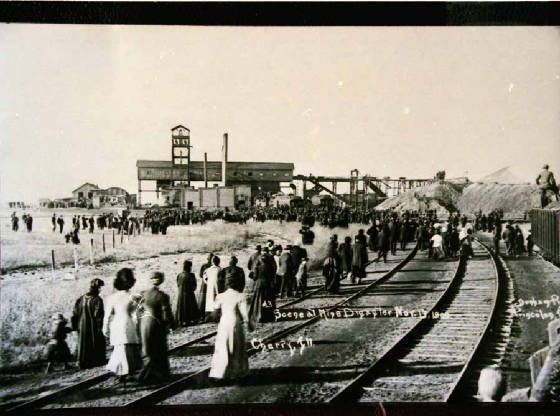 Approximately 1500 tons of coal were mined daily and used for the railroad. 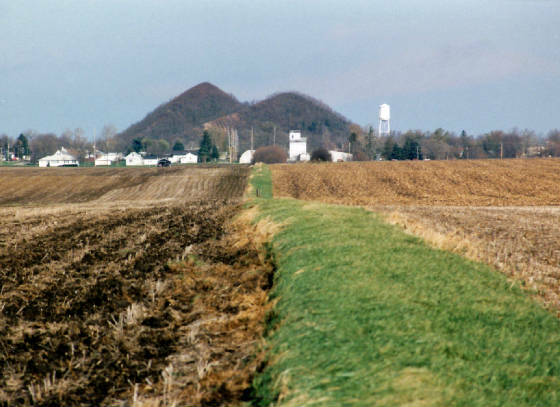 About 300,000 tons annually were dug up in a year, not excluding all the dirt, shale, slag, and rock. It was about 1500 tons a day which would be about 3,000,000 lbs and each coal car was a wood sided gondola (41' long) having a capacity of 100,000 lbs each. This would be about 30 train cars pulled out of Cherry a day. Pulled by 10-wheeler locomotives. So that would be about 30 cars. 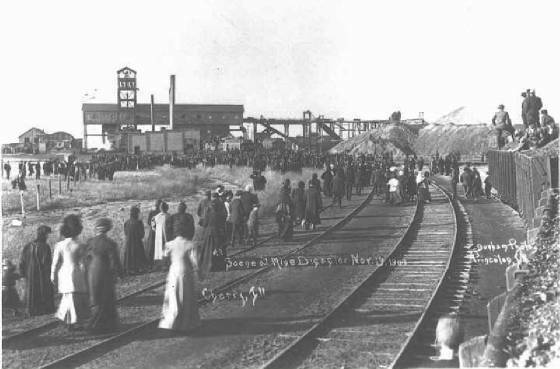 Miners received $1.08 per ton; a good day was about 5 tons from two miners. The mine below had three levels or "veins". The 1st level being 165 ft. below the surface, 2nd-315 ft. and the 3rd level was about 500 feet below. The coal at the 1st level was not mined because it had no commercial value. The fire started at the 2nd level at the escapeshaft/airshaft. A mine car (6x3) filled with hay (6 upright bales) was pushed in a spot where the kerosene torch dripped upon the hay load and a spark ignited the hay which was used to feed the mules in the mine. Due to an electrical short at the mine, kerosene torches were used to light the dark mine below. 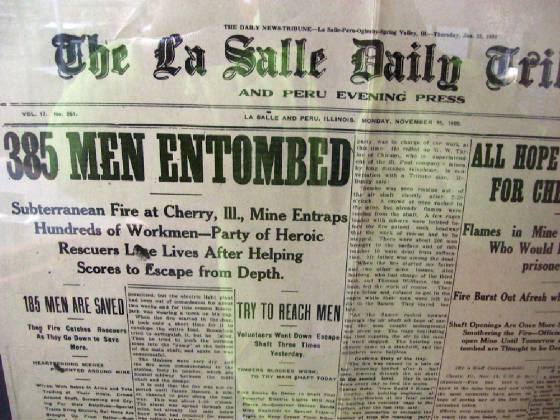 On Saturday, November 13, 1909 the tragedy began. 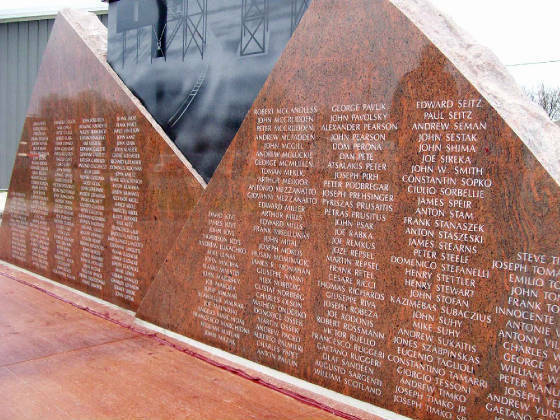 As a result, 259 miners lost their lives in the fire, and about 225 miners escaped. It is believed that about three miners are unaccounted for, probably buried in cave-ins. Black Damp is a poisonous gas that burns in an atmosphere lacking sufficient oxygen. This is what strangled the life out of most of the miners below. 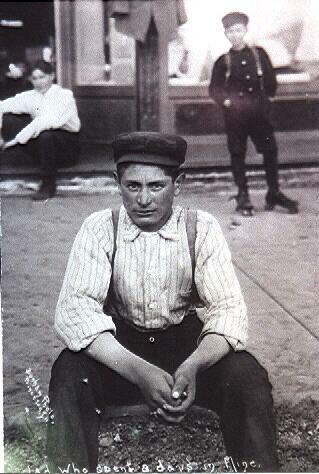 Twelve men made six successful trips into the mine to rescue men still alive. On the seventh trip those heroes died in the fire. The story of the 12 heroes is fascinating. Twenty-one miners survived eight days in the mine before rescued, basically without food nor water. They barricaded themselves in by earth walls on each side. These men were called the "Eight-Day Men." An epic chapter in the story indeed. It took approximately six months to retrieve all the bodies from the mine. Funerals where held almost daily for the lost coal miners. 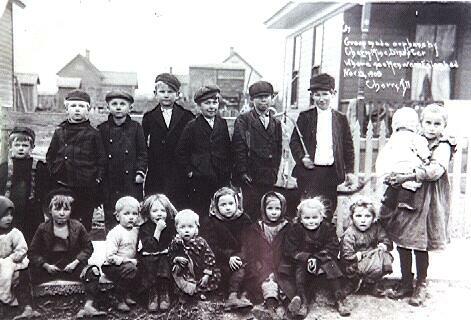 The mine reopened in Feb 1910 and was worked until 1927 by the St. Paul Co. 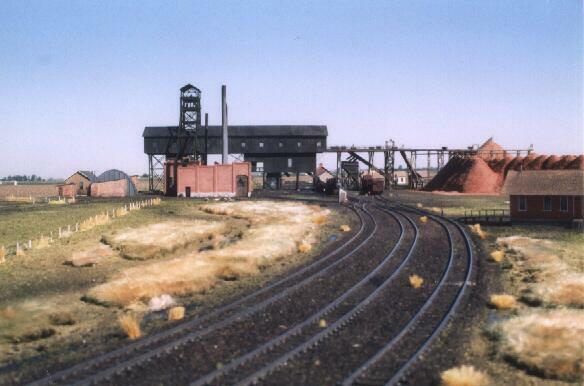 The Cherry Coal Co. (a small operation) then bought the mine in 1927 and worked it until about 1935. As a result of the terrible disaster, workmans compensation laws were enacted and safety regulations were brought about. Help cover costs to keep this website alive! A special thanks to the few who have donated. Thank you. 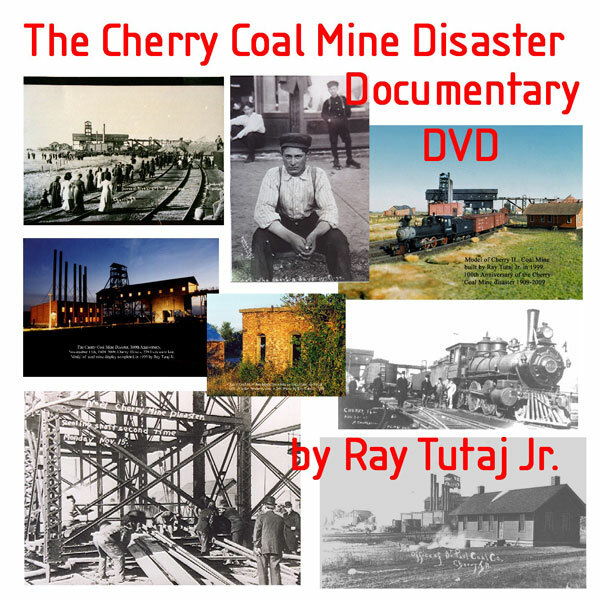 Get your copy of the DVD documentary on the Cherry Coal MIne Disaster. You can contact me at gjourney1@yahoo.com for a copy or visit the Cherry library. The 100th anniversary in Cherry was incredible. It was great to see thousands of people turn out for this. The many people who were relatives of the miners had interesting facts to share. 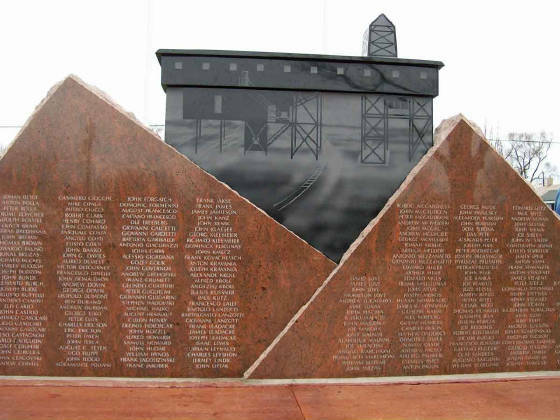 The unveiling of the new monument was quite a historic moment for the little mining town. I also want to thank folks for the donations to keep this website going. The weekend was spectacular and i was glad to be a part of it! Looking north about where the tracks once were. New Page! Nov 09, Cherry Mine artifacts! 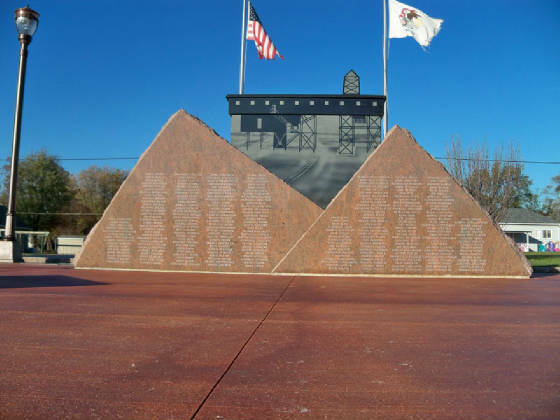 Pictures from Nov. 7th 2009 Sprinfield IL., Remembering the disaster with authors held at Abe Lincoln Presidential Library. Click here for details. Please note: Thanks to any donations toward this website. It helps to keep this site going ( it was free but now they require a payment annually, because much more space is needed) Donations help keep it updated and of course the site to be made available. Look for new things now and in the future. Feel free to use the donation link (at the bottom of the page) to help make the payments which are very reasonable! A little will go a long way. This site is for you! I gathered all of it for those who are interested. Thanks. Special thanks to Bob Roman for covering expenses in 2017 and previous years. Thank you Bob! Built by Ray Tutaj Jr. Compare with model picture above this one. Photo of Model by Ray Tutaj Jr. Note: Anniversary of Disaster is usually on the Sunday closest to November 13th. However please make sure before you make travel plans. 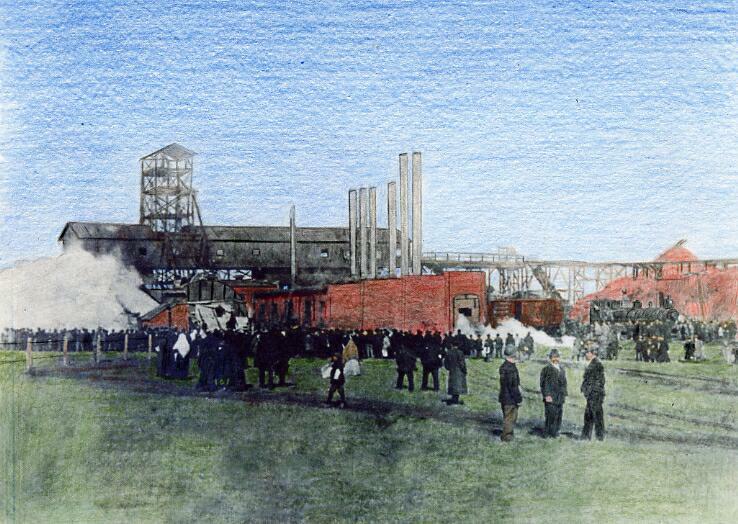 The dramatic photo below was taken the following morning on Sunday, Nov 10th, 1909. Miners were trapped below in the smoke filled mine. The next seven days would be a fight for twenty-one who would survive the disaster while 259 would die. There were about 230 who made it out the day before on Saturday. Crowds of family and curious people gather around to watch the drama unfold. Two newspaper boys carrying the headlines of the Cherry Mine Fire, can be seen in the photo. (photo colorized by Ray Tutaj Jr.) Scroll down for more photos and text! Smoke billows out from airshaft from reversing the fan. is filled with such dramatic interest thus making it tailor-made for a "big time" motion picture that would make the Titanic story dwarf in comparison. The Titanic hit an iceberg and sunk in a matter of hours. 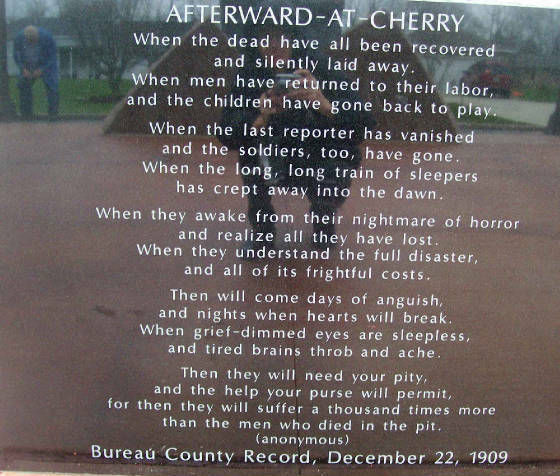 But in the Cherry mine disaster it was weeks before a final death toll could be figured. 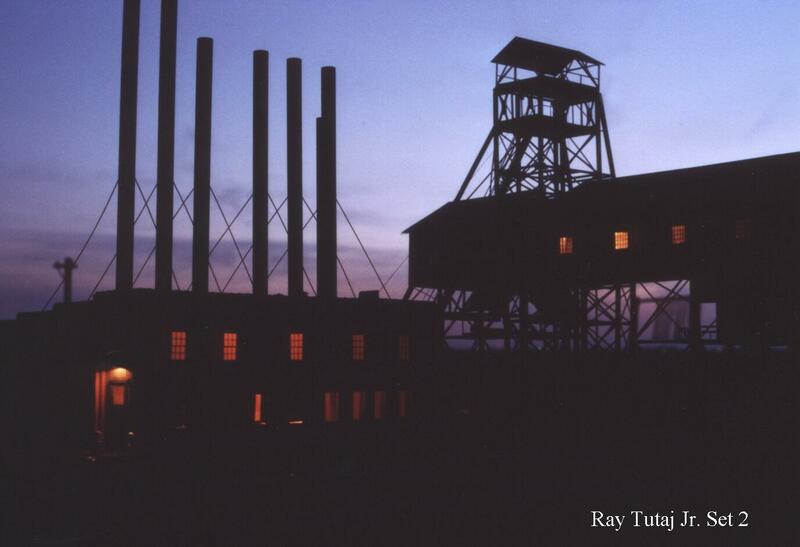 The Cherry mine tragedy has so many fascinating sides to it and contains every human emotion from the highest heights of triumph over death to the lowest depths of sorrow the heart, soul and mind can ever experience. Stories of heroism, sacrifice, love and romance, and the unforgettable story of the eight-day men. Nerve-racking suspense it was, because of the quick decisions that would affect the miners young lives. This Tragic story is deserving of a motion picture so people can learn about this moment in time and how it had a profound effect on the mining industry and how it affected workers rights. This site is packed with photos, diagrams, stories and more! 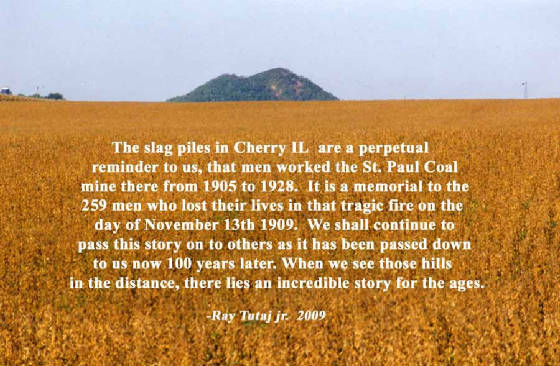 You will find fascinating info concerning the Coal Mining Disaster that took 259 young lives on Nov. 13th 1909, in Cherry IL. Use this site for research and study. Ive got plenty of pictures and information for you so come on in! There are numerous images, so please be patient while the pages load and enjoy what i have made available for you. 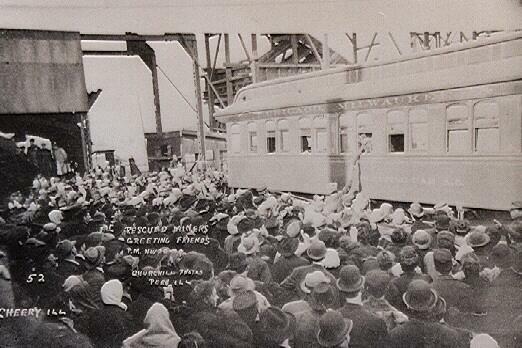 Hi I'm Ray Tutaj Jr. and I want to share with you this historic occurrence which happened on November 13th 1909. I hope you too can become fascinated with the story as I have. 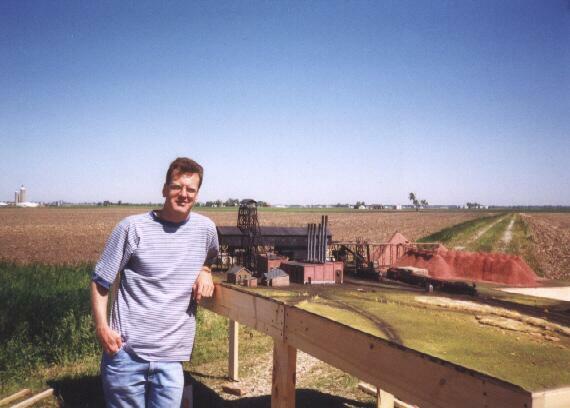 I was so intrigued by the story I ended up building an HO scale model replica of the mine site. It took me almost two years to complete, but it is finished and on display in Cherry IL. at the public Library. Before I started building the model, I had read everything I could on the subject and gathered every photo possible. I was also able to obtain numerous maps and diagrams to complete the vivid picture I wanted to have in my head of the mine site. There was only one thing left I could do which would be the closest thing to traveling back in time; build a detailed model of the coal mine site. So I did, and you will see some of the results here at this site. But, before setting up the display in Cherry at the library, I thought it would be a once in a lifetime opportunity to set the entire layout up outdoors for a photo shoot, in a remote setting in the country. The natural sky and lighting would further add realism to the model. I will never forget that 15-hour day from sunrise to late evening, photographing the model of the mine. It was very special for me, for it was like actually being there at the site in 1909. The pictures came out so well, that people wanted copies. So I then came up with the idea of having a few made up each year at the time of the anniversary. You can find out how to obtain some of these pictures on the About Me page. 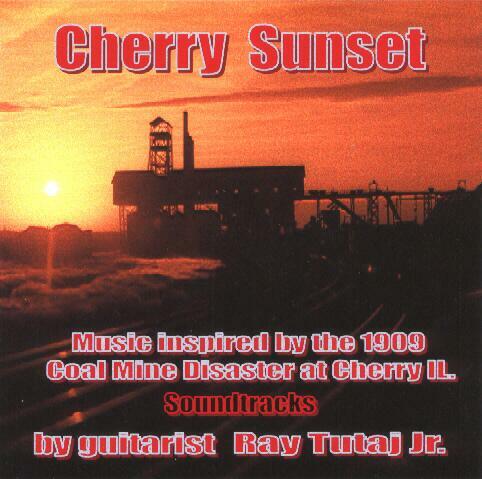 Now come with me on a journey back in time to the Cherry Coal Mine. I will try my best to add new stuff to this site often. I recommend you to start by looking at the " basic facts" page first, right below, and then make your way down the links..
Twelve men made six successful trips into the mine to rescue men still alive. On the seventh trip those heroes died in the fire. Twenty-one miners survived eight days in the mine before rescued, basically without food nor water. They barricaded themselves in by earth walls on each side. The mine reopened in 1910 and was worked until 1927 by the St. Paul Co. 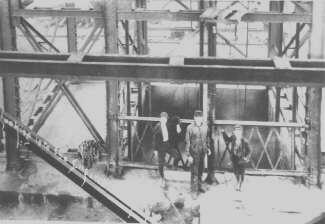 The Cherry Coal Co. then bought the mine and worked it until about 1935. Hope you are finding the pictures of interest. I have many enlargements of pictures and map diagrams on some of the other pages. Please let me know if you liked the site i have made available for you. This site has now been up since 2001, if i remember correctly. I can't tell you how much work it has been and how i built the first one only to have it disappear in thin air from a server that folded. I thought I was going to go crazy and i probably did. I get emails continually with people thanking me for this site and asking questions. I do my very best to reply and update the site for everyone. Donations are welcome! I continue to pay about $54.00 a year for these tripod sites. Scarcely ever a donation. I give and I give myself away. What's new? My new website of my best photography! There were moments of joy for some fortunate miners and families. 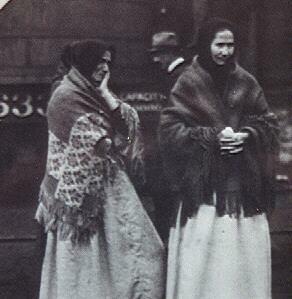 For many of the women it was pure agony. Some women lost a husband, son(s) and brothers. Can you imagine? Three levels. Third level was at 500ft. Fire started on second level 315ft. below. Children who became fatherless from the tragedy. The disaster affected thousands of relatives too. Please get in touch with me if you have any comments to my site.